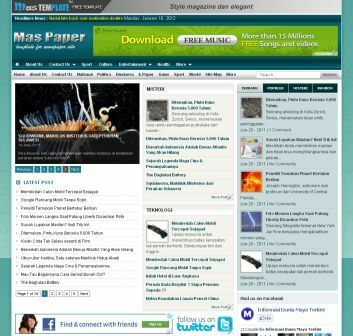 Terimakasih anda telah membaca artikel tentang Mas Paper Blog Template (Cyber4rt). Jika ingin menduplikasi artikel ini diharapkan anda untuk mencantumkan link http://artofhacks.binushacker.net/2012/09/mas-paper-blog-template-cyber4rt.html. Terimakasih atas perhatiannya. wah keren juga nih templat nya sob...? kunjungan balik nih....???? Hargai penulis artikelnya cok ! Komen ente gak berubah dari blog satu ke blog yang lain ! Jangan nyampah ! google memang tidak melarang. Tapi hargailah penulis artikel. Ente nulis visit back terserah. Tapi komentari dulu artikelnya. Jadilah blogger beretika. ! Ane hadir disini sob,selamat tuk template Maznya,moga betah dengan template barunya. The fine wood products on this site are the result of over 20 years of woodworking and custom furniture making. Located in Lower Sackville, Nova Scotia, Bobby designs and creates fine furniture to suit a wide variety of customer needs. Bobby’s talent is expressed through the many aspects of wood working and custom furniture making. His passion for wood extends beyond handcrafted fine furniture. He has a growing line of wooden art, sculptured furniture, and projects for residential and commercial environments. Explore Bobby's Gallery to see a wide variety of his custom handcrafted fine furniture, including his Classic Colonial Pine Series, unique rocking, kitchen and office chairs, sculptures, customized wood working projects and more. Bobby has also been featured in the 2011 online edition of the Eastcoast Living magazine. Just contact Bobby to find out more about his wood products and services.